- My Blog Found Here! This is a great place to see what is going on in and out of the studio. 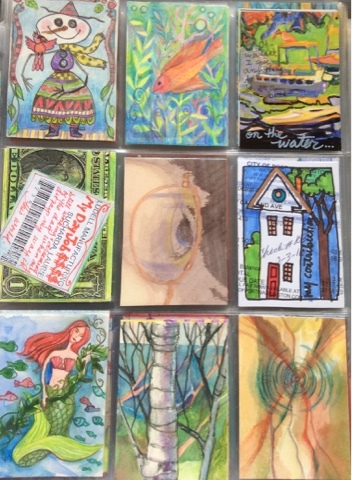 I decided to store my ATCs for the year in pocket pages, each holding nine cards so each page is a little more than a week. Some are just random images, some more about the day, like a diary. I have been spring cleaning and pulled a purple sketchbook out of a drawer where its been dwelling, unused. I don't know if all artists and crafters do this, but I have a habit of saving certain paper, paint,etc. for "good". In other words, I don't want to 'ruin' the sketchbook, so I put it away waiting for that day when my paintings are worthy of it. Perfectly good supplies are purchased then saved for a special project. Yet my best work often comes when I experiment and play around with my materials. Another event that happens in my studio is what a friend once referred to as U.C.P., or unfinished craft projects. I know we have all started a painting or project and then didn't like the direction it was going, made what we think is a fatal mistake in the piece, or just are interrupted and we never get back the energy that was flowing on the art and we lay it aside. (Hence, the reason for the spring cleaning!) Both of these situations come together in this sketchbook. I found it while I was cleaning. I had bought the book on sale and set it aside for a "special" project - maybe a mandala book, or a travel diary. But then I thought - no, I am just going to use it. So, I started thinking I would use it as an experimental place for limited palette work in watercolor. I had started and then found that I had more than a few very flat sketches. And I put it away. I used to preserve even these flat sketches, thinking to look back and see my progress. But this time I decided to rework them. The following are a few of my reworks, I did the first day. Unfortunately I didn't think of taking before and after photos until I had gone through these. But that's what I will be showing you in the next few weeks. More of this sketchbook can be seen on my facebook page. We pulled into Camping in The Clouds, Florence WI just at sunset. Our vintage camper is there. We uncovered it for the season and as usual will have some repairs to make. But we were suprisingly mouse free this winter. We look out from the ridge to the southwest and on a clear day can see 20 or 30 miles. This view always inspires us. We want to come, spend all summer, but still need our day jobs for a while. Each year when we open the camper its like a new energy fills me. Its a place we never tire of being. I have been doing a lot of thinking about being and what I want to be, what I want my life to be. This January, I was made officially full time at the seasonal/part time job I have had for the last 10 years. They needed the help and I decided to give up some of my art time to make a little more money to put into my career. We get really busy in the accounting department during the winter months and my art making can easily fall behind. Making art, or something, (more about that in another post) is like breathing, I CANNOT sit still and do nothing. Even watching TV or riding in the car I am making. But being full time, is a double edged sword. Either I only work a few months of the year, or a few days a week and don't have a lot of money to invest in my self as an artist. Or, I work more hours a week, have plenty of money, but loose a lot of time to make art, and work on sales, marketing, teaching myself computer skills... Soon, my partner in life Dave will be retiring. As I am younger, I will have to continue to have an income. So I am starting over. Again. Trying to find a way to have a career that will also allow me time to spend in retirement with Dave. Short of the lottery, I would like that to be making, creating, whatever you would like to call it. I have always wanted to grow up to be an artist. You might think I should be there at age 55. But I think I am still growing. Please come along as I grow and change. Meet me in Florence, or Port Washington, where we live the rest of the year, not far from Lake Michigan's beaches. 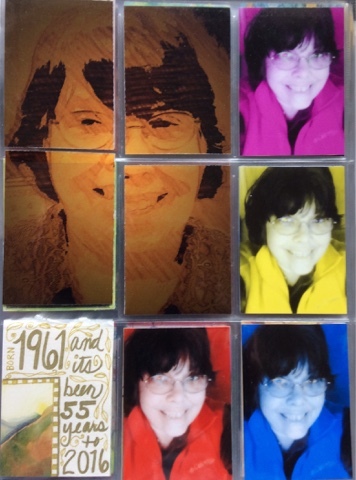 I will be revamping my website, blogs, and showing some new art along the way. Its been a really long day doing computer work for my art business. I am working in Florence and sharing the deck with this little guy. I had to work at the table in our camper, it only reached 47 degrees today. A little too chilly to be outside typing. It may be in the low 30's tonite. I am not ready for summer to be over. 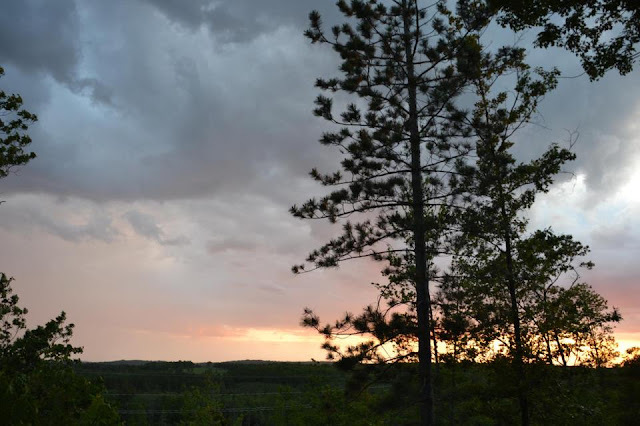 I have been plein air painting this summer with a group up here. Painting on site is so much different than painting from photos. First, there are so many choices to make about size of painting, which part of a scene do you want to paint, color palette, etc. When I get to a place I want to paint, I first take out my camera and just walk around capturing scenes. Not only can I paint from them later, I find its helpful to have a reference of where I started the day in case I don't finish a painting on site. Lots of things can affect the decision to not finish a painting. This summer the wind blew over my easel soaking my nearly finished work with spilled turpentine - it washed away paint and was definitley too wet to work more. Next I set up easel, palette, a painting chair. Then I get down to painting in a sketch; either complicated or very simple depending on the subject. I use thinned paint, usually in local color on white canvas. But I also like to use toned canvas (I will save that topic for another post). Then more choices to be made. Do I want to paint very quickly to catch the light before it changes. Or should I get all the particular trees, sky etc blocked in and worry about light later. 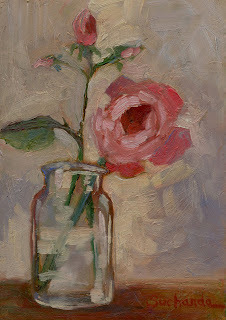 If it takes too long to paint, light and the composition of a painting can change dramatically while you are painting. This also happened this summer, taking my shadowed backlit scene and changing it to a sun drenched image, NOT what was on the canvas. And then there are critters. Those that bite and fly into your paint. Those that wander across your field of view just long enough to inspire and frustrate you. They rarely stand still long enough to get a very detailed rendering. 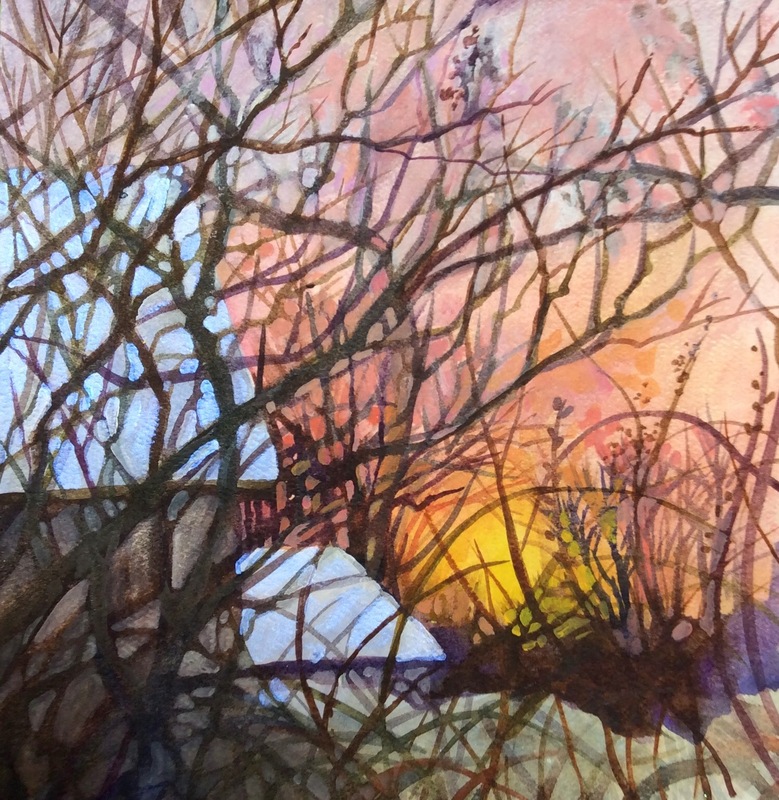 So in addition to accepting the challenges of outdoor painting, maybe I will continue to capture critters, flowers, skies, trees, rivers and lakes with my camera. Like the little guy who visits on my deck. And then paint the little critter later on. It's late July and I am spending the week away. Away from work, house chores, family obligations, but not away from art. 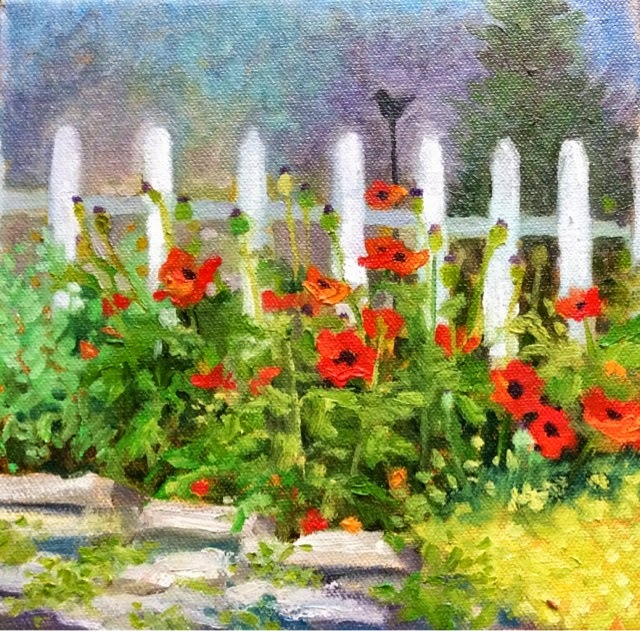 Yesterday, I spent the day plein air painting with the U.P Plein Air Painters. This is my painting for the day. I went back and forth about how to approach this painting, as did the sunshine. the day started out rather gray, but with very even lighting. Then just as I finished blocking in the drawing, the sun came out, backlit the entire riverbank and turned the water into molten gold. 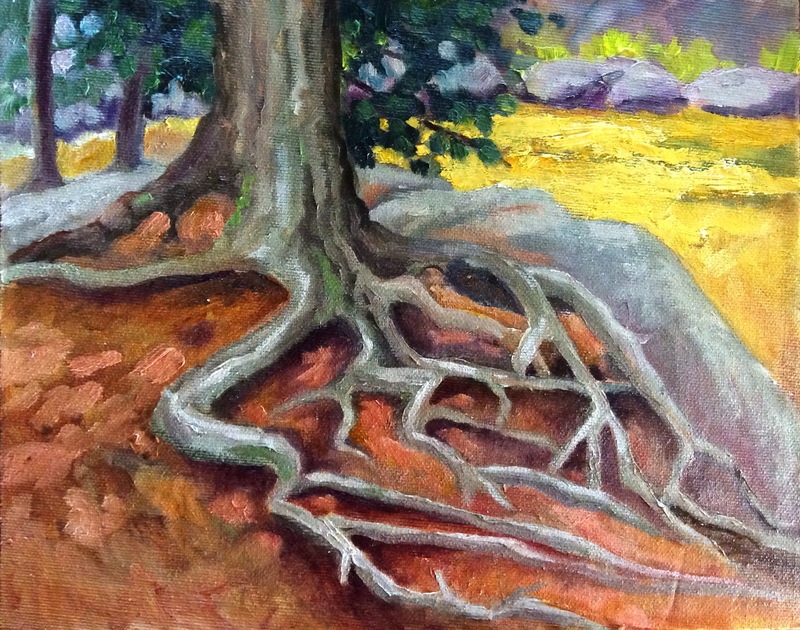 I was drawn to the tangle of roots in this area. Strewn with lots of giant rocks, the ground is crawling with root formations. 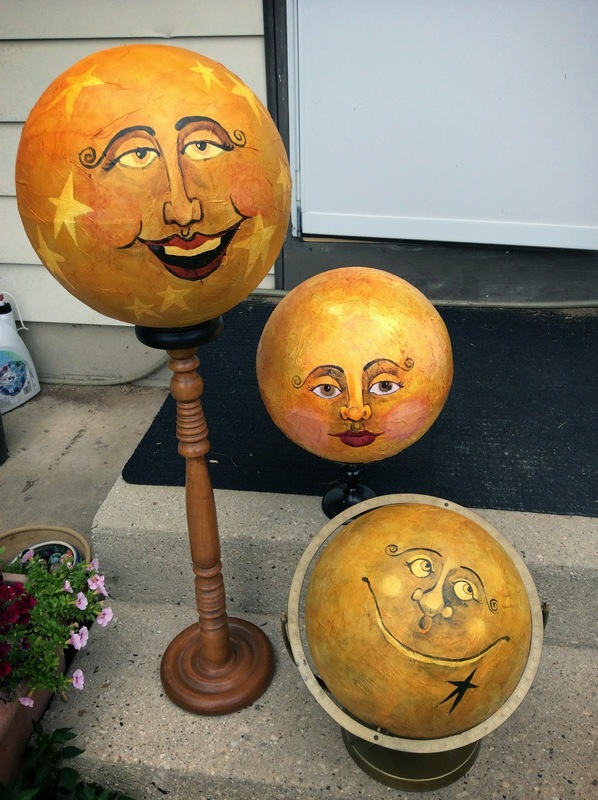 Three new globes, finished for Wausau's Art Weekend, Sept. 6&7. Every year I try to come up with some new faces to paint on my up cycled globes. These are just a standard, nothing special globe that is outdated, or damaged. Do you know how many kids seem to find it irresistible to use markers on a globe? This year the faces seem to be coming out rather whimsical and sweet. Some years they have been really creepy scary. Every year, I think I will run out of globes, but people keep bringing them to me and I just can't resist making the man in the moon or the lady, La Luna. This is my studio. What you are looking at is the top of my vintage drafting table. I cleaned a very dirty warehouse in exchange for the table and a number of industrial flat files. Because I don't want to damage the top with paint, I cover it with cereal boxes, taped together. It makes an incredibly waterproof surface, that protects the table. The bonus is that I get some incredible textured surfaces, which I can use for collage bases, journal covers, altered post cards.....I keep the paint in a couple of old Pepsi boxes that can easily be moved as needed. That's my watercolor journal laying open. U was reworking a sketch that I was unhappy with. I reuse an old Prang watercolor box. At one time it held kid's paint, but now I put tube colors in. 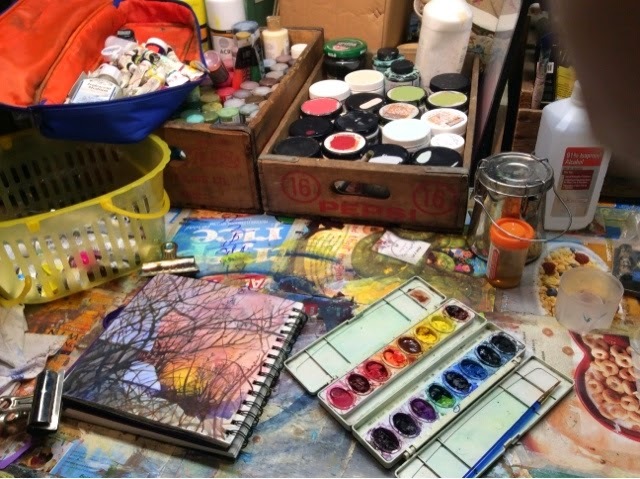 I have several in different color combinations.Storage to the right of the table is pretty jumbled, tends to be a space where things collect, but are easily accessible.Directly behind me is my home made easel. Staved around it right now are unfinished starts and prepped boards for my small oil sketches and daily paintings.Now I would love a beautiful, spacious studio, hardwood floors, big windows; you know just like in the magazines. But what I have is this half the basement. Over the summer, I plan to revamp a bit. But instead of ripping it up and trying to move everything, I am going to use up and discard as I make art. Maybe by the end of summer, I will have a fantastic new studio design AND a whole lot of art made! Keep watching for progress.